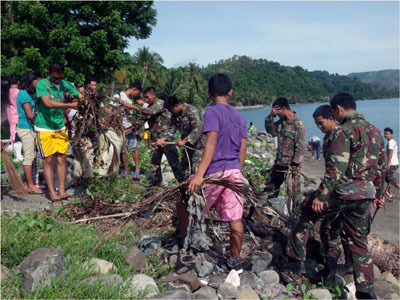 Soldiers and students clean a coastal village in Malita town in Davao del Sur province. DAVAO DEL SUR, Philippines (Mindanao Examiner / Sept. 18, 2011) – Filipino soldiers and students joined for a coastal clean-up in the town of Malita in Davao del Sur province, security officials said Sunday. Officials said the two groups trooped Saturday to a fishing village where residents welcomed them. The students, from the Benjamin V. Bautista Special High School, and soldiers who were part of the Task Group Mulawin, mingled with the locals during the activity. “This is only a single part of their program for the ongoing intramurals,” said Roberto Abellana, officer-in-charge of the Benjamin V. Bautista Special High School. Lieutenant Colonel Adolfo Espuelas, the task group commander, said they would continue their peace and development projects in the town in cooperation with local village and government officials. 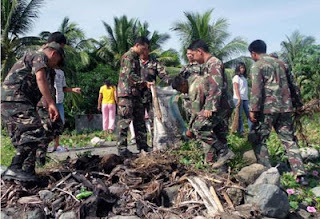 “We are united by one common goal that is supporting the environmental programs of the government, the soldiers are ready and there to extend help in order to make their activity successful,” he said.